Just plug it into a guitar amp and have fun! 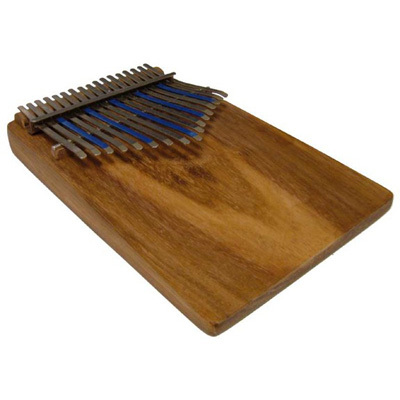 The Hugh Tracey Celeste Treble Kalimba - this model is thinner and ideal for smaller hands. The tone of the Celeste is a little softer than the Treble, but great for recordings. It does not have the vibrato holes, but a very ethereal sound can be obtained on a mike. This Hugh Tracey Celeste Treble Kalimba is available with a built in electronic pickup. Just plug it into a guitar amp and have fun!